Curtin discuses the upcoming squad. Preseason training begins January 22nd at Penn, before two camps in Clearwater, FL. BJ Callaghan talks about his recent move to the USMNT and his time with the Union. 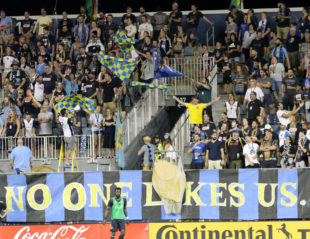 The Union wish their favorite supporters group, the Sons of Ben a happy 12th birthday (and Betty White as well) yesterday. HAPPY BIRTHDAY @SonsofBen! Happy birthday Ben Franklin! And while we’re at it, happy birthday @BettyMWhite! Academy players, Brendan Craig and Samuel Fenton talk about their recent US call-ups. EPYSA announced its 2018 annual award recipients. Here’s the list of the longest-tenured head coaches of each MLS team. Jim Curtin is tied for third as he goes into his fifth season as the Union’s coach this year. Atlanta United sign Josef Martinez to a five year contract extension, making Atlanta his home, his “Barcelona or Real Madrid”. Austin FC is “highly motivated” to build the club from the ground up. Rosenberry talks about the USMNT camp and his hopes to begin a US national career. Trying to expand and improve the Youth National Team player pool, US Soccer launches a new U14 talent identification program. Europe’s transfer window in all of its ups and downs. Ten things to look out for in the Premier League this weekend. Alphonso Davies has begun his chapter at Bayern Munich. Reportedly, De Gea is actually excited about Manchester United’s direction and wants to sign a new deal. When faced with a sexist question about the men’s locker room, this newly appointed female German head coach sarcastically said she picks her team based on the size of a certain male body part. Imke Wubbenhurst has the best smackdown of this year so far! Hope she gets her side promoted and has a long career! MLS’sbArmchair Analyst, Matt Doyle, speculates that Ernst Tanner’s past,means the Union will play a 4-4-2 high pressure style. Haris cannot gegenpress. Asking him to do so will fail miserably. I’m not confident he can be anything but a deep lying regista with a very low defensive work rate. Yup. After letting both Yaro and Marquez I started thinking a back 3/5 was not coming then the Rosenberry trade sealed it. Also his last job was at RB Salzburg so a 4-2-2-2 (4-4-2) pressing system makes sense.